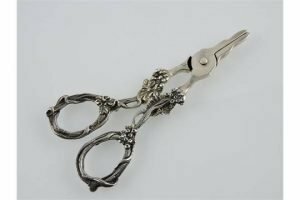 A pair of silver grape scissors, chased with vine leaves, London 1977. 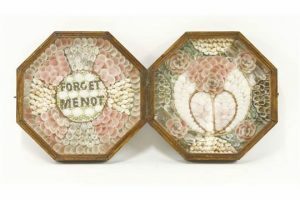 A sailor’s shell valentine, mid 19th century, the hinged octagonal glazed case revealing coloured shells arranged in geometric patterns, centred with a heart and the wording ‘Forget Me Not’. 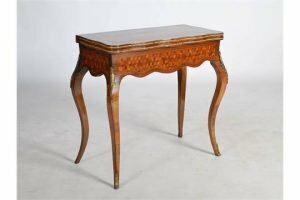 A 19th century rosewood, parquetry and gilt metal mounted card table, the hinged rectangular top with a serpentine edge, opening to a green baize lined interior above a shaped frieze, raised on four cabriole supports with foliate cast mounts and sabots. 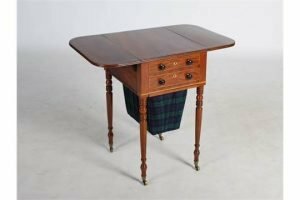 A Regency mahogany and brass lined work table, the rounded rectangular top with twin drop leaves and reeded edge, above two small drawers and later tartan upholstered work bag, raised on four ring turned tapered cylindrical supports with brass cups and casters. 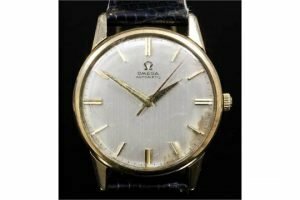 A modern gentleman’s 9ct gold Omega automatic wristwatch, the silvered dial with baton numerals, contained in plain 33mm diameter case, on non-conforming brown leather strap. 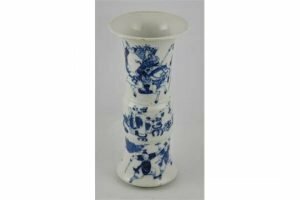 A Chinese 19th century waisted gu-shaped blue and white vase, decorated with showmen on horses and warriors, having interior Buddhist treasures. 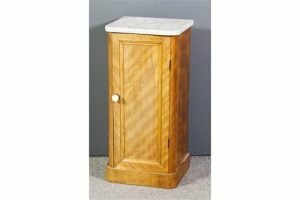 A late Victorian satin walnut bedside cabinet, with white flecked marble slab to top enclosed by a single panelled door, on plinth base. 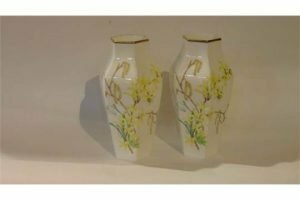 A pair of Wedgwood vases of hexagonal form, painted with forsythia, snowdrops and catkins. 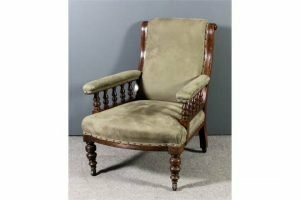 A Victorian walnut framed scroll back open arm easy chair, with turned spindles to arms, the seat, back and arm pads, upholstered in mushroom cloth, on turned front legs and castors. 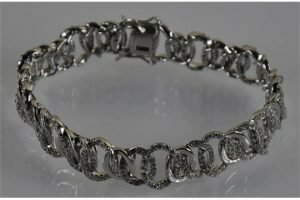 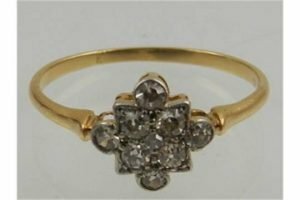 A silver bracelet set with cubic zirconia in a fancy oval pattern. 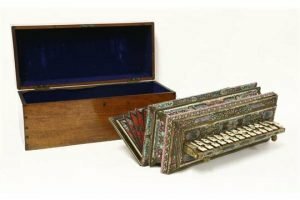 An ebonized and boullework flutina, with twenty-nine keys, mounted with cast masks and heads, with silvered and plush decorated six-fold bellows, the underside with three further buttons. 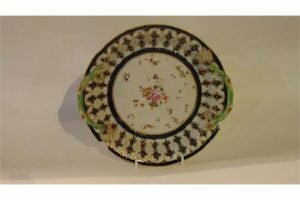 An 18th century Derby serving dish of circular form, with painted floral sprigs and sprays to the central panel within blue and gilt moulded floral borders, and with moulded handles in the form of leaves and stems. 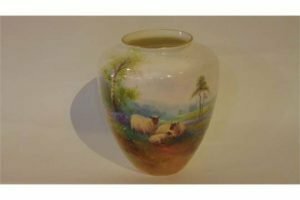 A Royal Worcester vase of shouldered form, with finely painted panel of sheep in a landscape setting beneath a tree with drifts of bluebells. 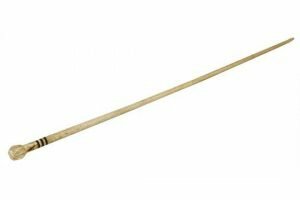 A whalebone and horn-mounted walking stick, mid 19th century, with a faceted ball terminal, three rings, with a tapered shaft. 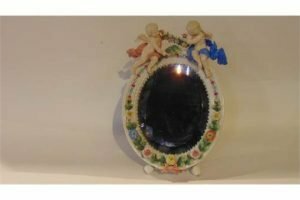 An early 20th century continental mirror frame, with encrusted floral decoration and applied figures of cherubs holding a floral swag, enclosing an oval bevelled mirror. 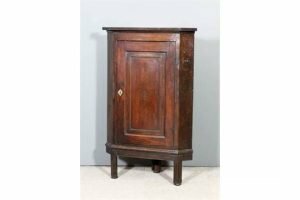 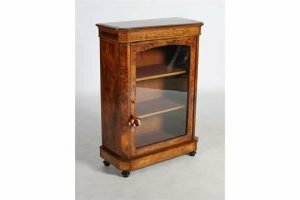 An 18th Century oak hanging corner cupboard with reeded edge to top, fitted two shaped shelves enclosed by a panelled door inlaid with ovoid shell motif, on later chamfered legs. 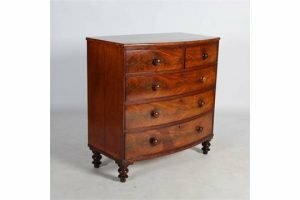 A 19th century mahogany bow front chest, the shaped rectangular top above two short and three long graduated cockbeaded drawers, raised on turned bun feet. 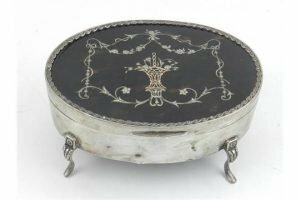 A silver and tortoiseshell oval jewellery box, having damascened inlaid decoration and raised on four cabriole legs, by William Comyns & Sons Ltd, London 1927.